Pokemon, Mario, and My Little Pony Birthday’s Oh My! It has been birthday central in our house these past two weeks. 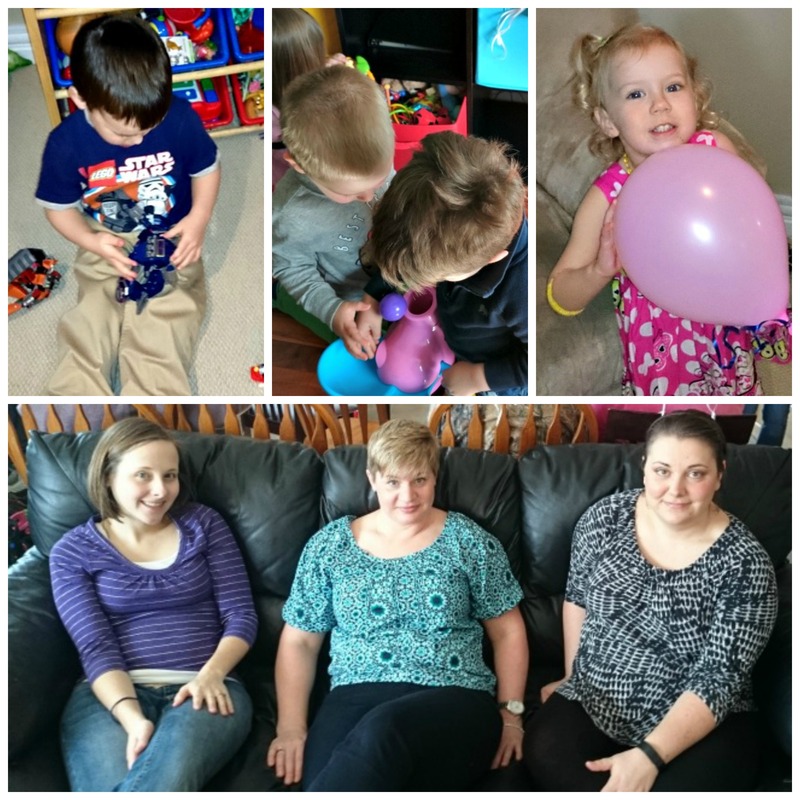 Simeon turned 5 on February 23rd, Ariella turns 3 on March 5th, Asher turns 1 on March 6th. This year we decided on having two birthday parties. And we decided we were crazy/cheap enough to have both of them at our house. The first party was Simeon’s class birthday party. 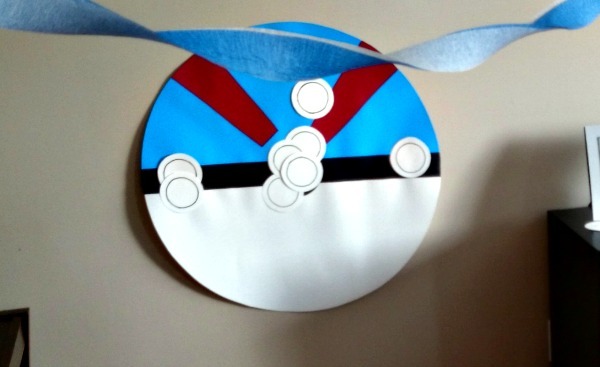 He wanted to have a Pokemon themed party. The second party was for all three kids and we invited our friends and family over. That party didn’t have an overarching theme but Simeon and Ariella got to put in their cake orders with Meghan’s mother (Grammie) who is a cake decorator by trade. SImeon asked for a Nabbit Cake (from New Super Mario/ Luigi Bros U) and Ariella asked for a Pony cake. Here is a quick rundown of each. This one was hard to get ready for. While Pokemon is going strong in the worlds of video games and TV there are no readily available birthday products to make use of so we had to improvise a little. These are the cupcakes I made. 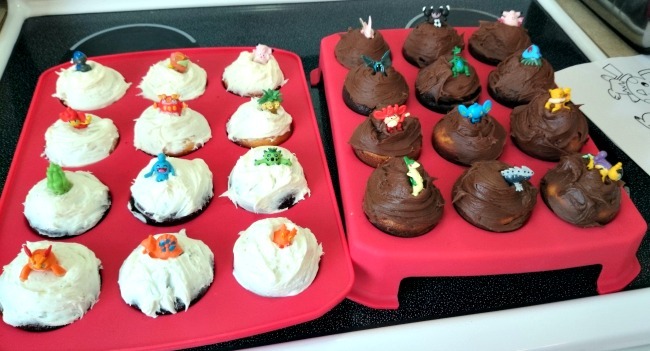 The cupcakes are made from scratch, but not the icing. I hate making icing. The little Pokemon toppers came via eBay. Well sort of. We ordered some weeks ago but they didn’t come in time. These ones are/were some of Simeon’s actual toys. We assured him new ones were coming. 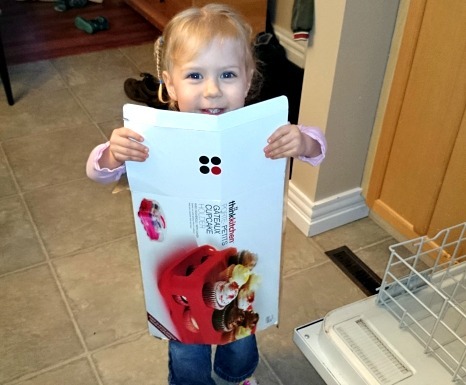 While I was baking the cupcakes and tidying up some dishes Ariella decided to have fun with my new cupcake holder box. And of course she played everyones favourite party game, stick the centre dot on to the Pokeball! On the off chance any of you are big Pokemon fans and wondering why we used the ‘great ball’ instead of the standard red and white pokeball the Olympics here in Canada produced a red bristol board shortage. Hot Potato: We used one of Simeon’s pokemon stuffies to pass around when the music stopped you were out. 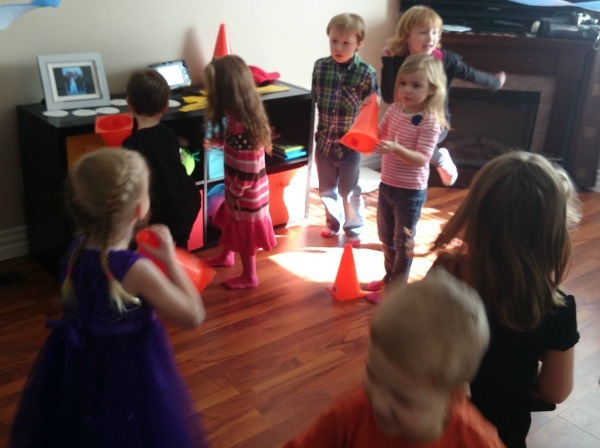 Pylon dance: A musical chair type game. But instead of sitting on a chair they had to touch a pylon when the music ended. Memory: Again we used Simeon’s collection of Pokemon stuffies the kids closed their eyes and Meghan hid one or more behind her back and they kids had to guess who was missing. 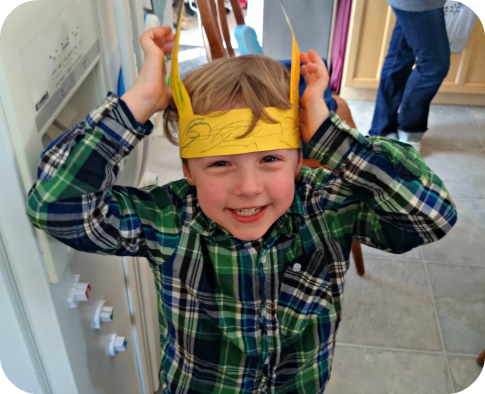 I think my favourite part of the party was when I was working with the kids making mini-pizza’s Meghan helped them to make their own set of Pikachu ear hats. Simeon still loves his. This party was much, much more laid back. We didn’t organizing any games, and we didn’t try to have a theme. 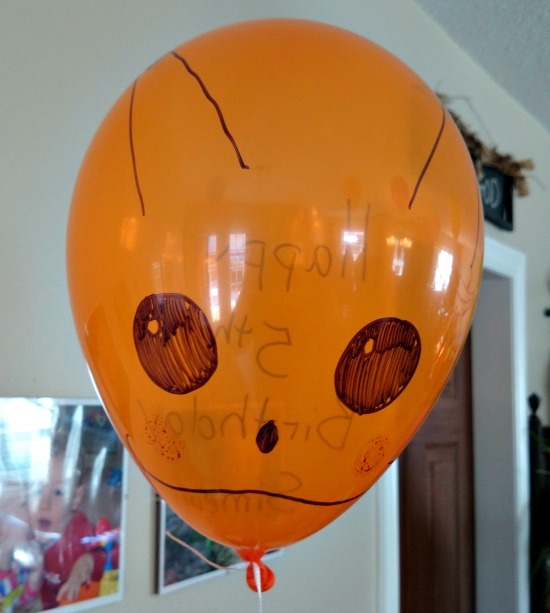 We tossed up a whole bunch of balloons around the house to decorate, we set out a lot of food, and we let the kids go to town eating and playing as they willed. Both our livingroom and family room were set for up for the party. At one point pretty much all of the kids migrated downstairs to the family room where most of the toys are, while most of adults stayed upstairs in the relative quiet to socialize. It was a pretty simple set up but I think everyone had a good time. The other fun part about this party was that we got to have three cakes. Asher’s cake is shaped like a giant cupcake, Ariella’s is themed after My Little Pony, and Simeon’s cake is a ‘Nabbit cake’ There are lots of giant cupcakes and My Little Pony cakes on their internet, but after a quick search I think this is the first Nabbit cake. You’re welcome internet. These parties took a lot of time and energy to get ready for and cleaned up from. But the cost came in very low. Between food, loot bags and decorations we spent around $125 total for both parties. That being said, I am glad we are done for another year. This entry was posted in Family, Geek, Holidays. Bookmark the permalink. those are pretty awesome parties! Great job on the cupcakes!